Paul Thomas, PhD, found in a recent investigation that an experimental cancer drug limited the flu virus’ ability to replicate in upper respiratory cells. The ingenious, diabolical part of the flu virus isn’t how it makes you feel when you have it — it’s that the virus turns lung cells into factories that churn out thousands more copies of itself to spread the infection. We found that by using an investigational cancer drug, we were able to dial down the flu virus’ replication and increase survival in preclinical models. Our research was published in the journal Cell Reports. Upper respiratory cells, called lung epithelial cells, are normally responsible for secreting and moving mucus. But infected cells change their metabolism and become the prime location for viral replication. The alteration rapidly increases these cells’ dependence upon glucose and glutamine, the raw materials of viral production. For example, PET scans of some of our pediatric cancer patients with flu and other respiratory infections showed a dramatic increase in glucose metabolism compared to patients without infections. We didn’t know much about how the flu changed the metabolism of lung epithelial cells, but we suspected metabolism left the virus vulnerable. We thought metabolism might offer a new approach to easing flu symptoms and preventing complications. Working with colleagues who study rapidly dividing tumor cells, we screened 80 small molecules and drugs that targeted cell metabolism rather than the virus. We identified some drugs that blocked a key metabolic pathway in flu-infected human lung epithelial cells. One of the drugs also eased respiratory symptoms and improved the survival of preclinical models infected with a pandemic flu strain. In addition, by targeting the metabolic process rather than an intrinsic part of the virus, there is less risk the virus will become resistant to the drugs. We identified drugs that limit the ability of the infected cells to use glucose and glutamine. As a result, the virus loses the ability to make more of itself. This suggests a possible treatment window that lasts several days in which drugs could be used to reduce the infection and risk of complications. Now we’re looking at other respiratory viruses to see if targeting metabolism might also be an effective treatment. 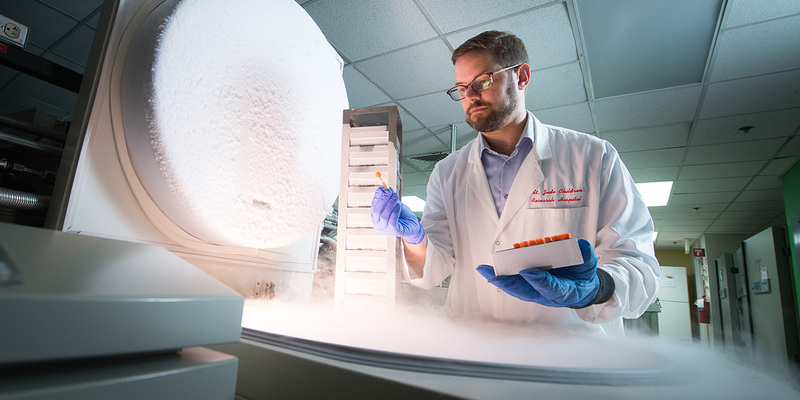 Paul Thomas, PhD, found in a recent investigation that an experimental cancer drug limited the flu virus’ ability to replicate in upper respiratory cells. View full bio. Why does the risk of pediatric leukemia relapse vary by race?